Born out of old warehouses, in the past few years, Fort Lauderdale’s Flagler Village neighborhood has materialized as a new creative hub. For M.A.S. Café Glavovic Studio upended convention with a design whose approach to materiality and use of space amplifies the Village’s sense of culture, sustainability, and community. The design is based on the understanding that the single most important element of the area’s growth is not the massive mixed-use buildings on the rise, but the small businesses and artist studios that abound due to the neighborhood’s newfound popularity. These urban businesses imbue the community with authenticity and a sense of place. M.A.S. Café is no exception as the owners are bringing, for the first time, farmer-to-consumer Columbian coffee to Fort Lauderdale. Glavovic Studio’s design uses four Corten steel shipping containers, connected and tilted at 30-degree angles. 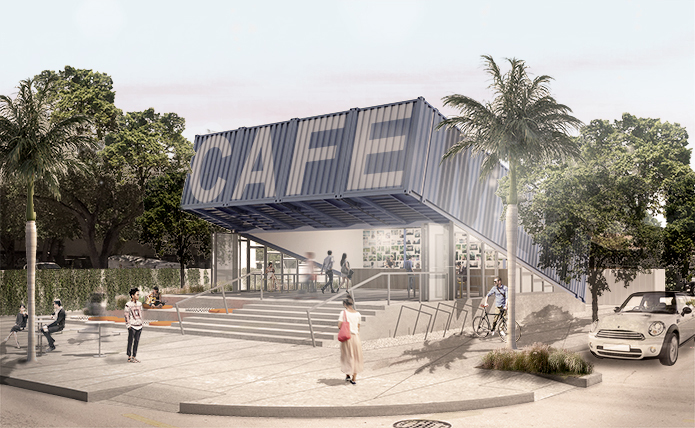 Meant to be left open completely in front to take advantage of South Florida’s climate, the Café spills forth towards the street with outdoor seating platforms and a wide plaza facing Peter Feldman Park on Sistrunk Boulevard towards the south. The concept of tilting the containers up to capture the breezes and pedestrian activity is reinforced by the raised podium, elevating and accentuating the vantage point of the project for all viewers from a distance. Indigenous landscaping and pervious surfaces curtail the project’s heat island effect. Interior spaces repurpose the plywood from the containers into bar furniture and expose new supporting structure. A large back wall photomontage along the bar tells the story of the family’s coffee plantation in Colombia. This familial touch extends to the café’s name, which is gathered from the first letter of the owners’ names: Marcela, Alejandro, and Santiago. 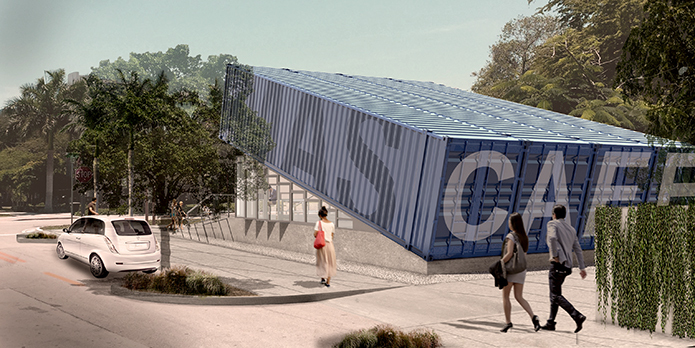 At 32’ across and 21’ at its highest point, Glavovic Studio’s plan for M.A.S. Café is scaled for pedestrians. Despite being located on important east-west axis linking the Northwest CRA District and commercial retail and restaurants east on Federal Highway, this design reinforces the pedestrian-friendly community emerging here with the proliferation of new housing and painting studios carved from garage spaces as well as mural-covered retail and office buildings. The small but iconic form of M.A.S. 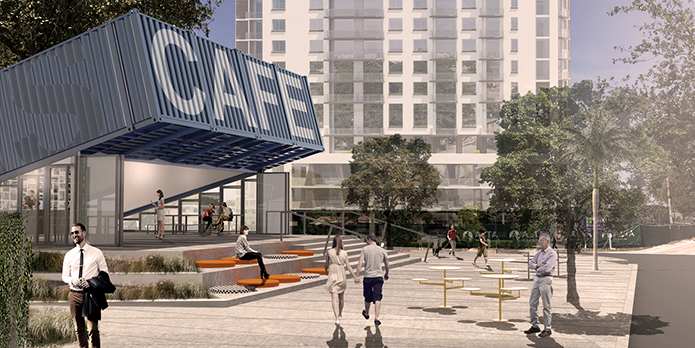 Café reflects and amplifies the spirit of the neighborhood in which it is sited.